Rivers are at the heart of defining the identity and lifestyle of many cities around the world, and that is nowhere stronger than in Newcastle on Tyne in the Northeast of England on the banks of the River Tyne. The people who live on the banks of the Tyne are fiercely proud of their river. Once the river was an industrial powerhouse of the British Empire, and by the 1880s the Port of Tyne exported the most coal in the world, and the river was amongst the world’s largest shipbuilding and ship-repairing centres. There has been much consideration of how the River Tyne has shaped Tyneside and Tynesiders, but very little appreciation of the enormous extent to which people have shaped the river. To bear out this invisible history of the river, historian Leona Skelton, a Post-Doctoral Research Assistant at the University of Bristol, has worked on a research project that challenges us to think from a river’s perspective and to include in our river histories the flow pathways which rivers ‘wanted’ to follow, regardless of the changes that humans have forged upon the river. On episode 69 of the Exploring Environmental History Podcast Leona challenges us to look at a river as an historical actor with its own agency. Leona’s Research was part of the British Arts and Humanities Research Council funded environmental history initiative “The Power and the Water: Connecting Pasts with Futures”, that focuses on environmental connectivities that have emerged in Britain since industrialisation. Chaplin, M., Tyne View: A Walk around the Port of Tyne (2012). Charlton, B., Upper North Tynedale: A Northumbrian Valley and its People (Northumbrian Water, 1987). Cioc, Mark, and ebrary Academic Complete. The Rhine: An Eco-biography, 1815-2000 (Seattle: University of Washington Press, 2002). 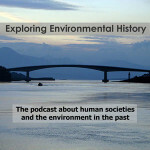 This podcast was simultaneously published on the Environmental History Resources website as part of the Exploring Environmental History podcast series. Great podcast and film, Jan and Leona (and you’re forgiven for not including Liverpool at the mouth of the Mersey as one of the world’s greatest river cities…).